How to Draw Class Diagram? Perform the steps below to create a UML class diagram in Visual Paradigm. 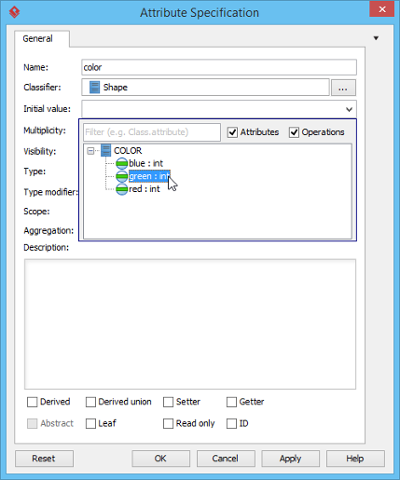 In the New Diagram window, select Class Diagram. To create a class in a class diagram, click Class on the diagram toolbar and then click on the diagram. Release the mouse button at the place where you want the class to be created. If you want to connect to an existing class, drop at that class. Otherwise, drop an the empty space (either at the diagram background or container shape like package). If you are connecting to an existing class, select Association from Resource Catalog. If you are creating a new class, select Association -> Class from Resource Catalog. If you want to create an aggregation or composition, select Aggregation -> Class or Composition -> Class instead. If you are creating a new class, you should see the class now and it is connected to the source shape. Enter its name and press Enter to confirm editing. 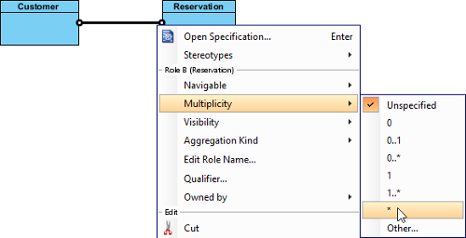 To edit multiplicity of an association end, right-click near the association end, select Multiplicity from the popup menu and then select a multiplicity. To show the direction of an association, right click on it and select Presentation Options > Show Direction from the pop-up menu. The direction arrow is shown beside the association. Move your mouse pointer over the superclass. Release the mouse button at the place where you want the subclass to be created. If you want to connect to an existing class, drop at that class. Otherwise, drop an the empty space (either at the diagram background or container shape like package). If you are connecting to an existing class, select Generalization from Resource Catalog. 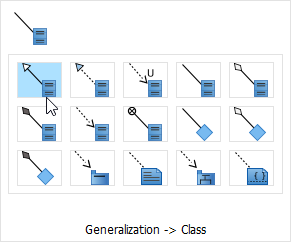 If you are creating a new class, select Generalization -> Class from Resource Catalog. If you are creating a new class, you should see the class now and it is connected to the source shape with a generalization. Enter its name and press Enter to confirm editing. You can also add a dependency from and/or to an attribute or operation in class. To create such a dependency. Select Dependency from the diagram toolbar. Press on the source shape or a class member. Drag to the target shape, or a class member. To create attribute, right click the class and select Add > Attribute from the pop-up menu. After creating an attribute, press the Enter key, another attribute will be created. This method allows you to create multiple attributes quickly and easily. To create operation, right click the class and select Add > Operation from the pop-up menu. Similar to creating attribute, you can press the Enter key to create multiple operations continuously. When the name of a parameter starts with "unnamed_", its name will not be displayed in the class shape, leaving the parameter type (if defined). To reord a class member, select it and drag within the compartment, you will see a thick black line appears to indicate where the class member will be placed. Release the mouse button, the class member will be reordered. To copy a class member, select it and drag to the target class while keep pressing the Ctrl key, you will see a thick black line appears indicating where the class member will be placed. A plus sign is shown beside the mouse cursor indicating this is a copy action. Release the mouse button, the class member will be copied. To move a class member, select it and drag to the target class, you will see a thick black line appears indicating where the class member will be placed. Unlike copy, do not press the Ctrl key when drag, the mouse cursor without the plus sign indicates this is a move action. Release the mouse button, the class member will be moved. 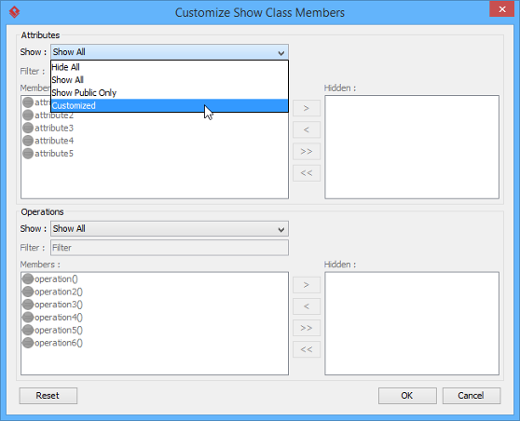 To select all members within a class, you can select any member first, and then press Alt-A to select the rest. Select the type of relationship to be created, under the diagram toolbar. Move the mosue pointer over the source member. Press on it and hold the mouse button. Drag to the target member. Release the mouse button to create the connector. While it looks like the connector is connecting the classes but not the members, if you check its specification you can see that the connector is indeed connecting the members. To create an enumeration in the uml diagram tool, select Enumeration from the diagram toolbar and click on the diagram to create one. To add an enumeration literal, right click on the enumeration class and select Add > Enumeration Literal from the popup menu. Then, enter the name of the literal and confirm editing. 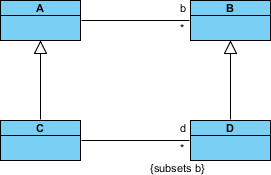 in which a general classifier (or superclass) may be divided using specific subtypes. To define a generalization set, select the generalizations to include, right click and select Generalization set > Create Generalization Set... from the popup menu. Name the set in the Manage Generalization Sets window, and confirm by pressing OK. The selected generalizations are grouped. Adjust the connector to make the diagram tidy. Repeat the steps for other generalizations. When project's programming language is set to be Visual Basic or C#, it is possible to define delegate method for classes. 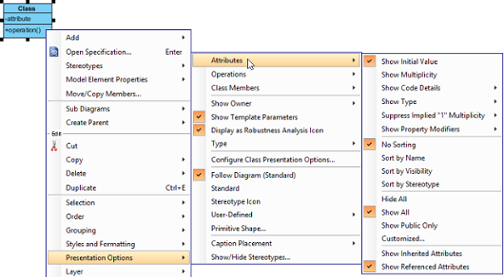 To define delete method, right click on the class and select Stereotypes > Delegate from the pop-up menu. 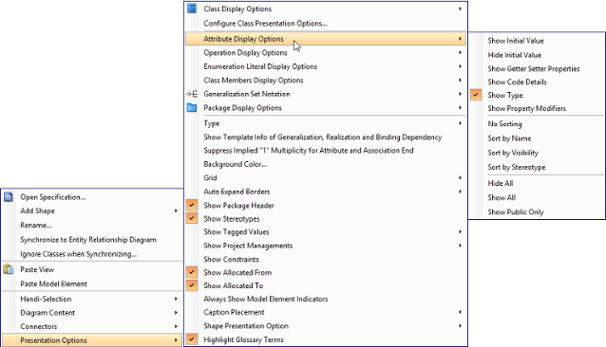 Select Window > Project Options from the toolbar to open the Options window. Click Diagramming on the list. Change the settings for Show attribute option and/or Show operation option. Right click on the class diagram to set the option. Select Presentation Options > Attribute Display Options / Operation Display Options from the pop-up menu. Select Hide All / Show All / Show Public Only. Right click on the class to set the option. Select Presentation Options > Attributes / Operations from the popup menu. 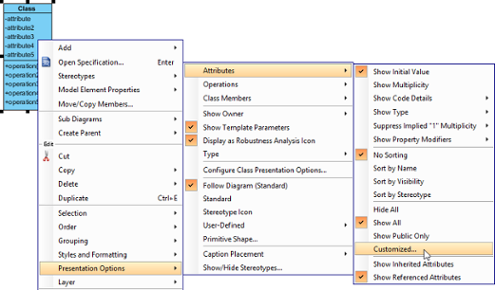 Select Presentation Options > Attributes / Operations > Customized... from the pop-up menu. Select Customized under the drop down menu of Show. Select the member(s) to hide and click > to hide them. 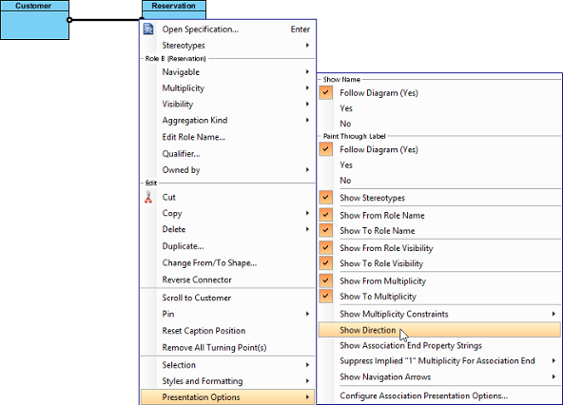 Open the specification window of attribute by right clicking on the attribute and selecting Open Specification... from the popup menu. In the General page of the specification window, enter the initial value in initial value field if it is a text value, or popup the drop down menu to select a public and static field of any class to be the value. NOTE: In order to select the attribute of another class to be the default value, make sure the attribute you want to select is static (i.e. set to be in classifier scope) and is public (so that other classes can access). Ownership of association ends by an associated class may be indicated by a small dot. To set the ownership, right click at the association end where you want to set ownership, select Owned by in the popup menu, then select either the association or the class at the opposite end. By selecting class, the small dot will be shown. Take a look at the sample below. The subset on d indicates that the collection d, which is an instance of class C, is a subset of the collection b, instance of class A. Right click on the association (where the subset end exist) and select Open Specification... from the popup menu. In the General tab, locate the association end where you want to define a subset. Click on ... for the Role property of the association end. In the Association End Specification, open the Subsetted Association Ends tab. From the list on the left hand side, click on the role you want to define subset for. Click > to select it. If you do not see any role listing there, make sure your model respect the pattern similar to the class diagram above - The class of both association ends are subclasses, and there is an association connecting their superclasses. Click OK to confirm and close the Association End Specification window. Click OK to confirm and close the Association Specification window. Right click on the association end and select Presentation Options > Show Association End Property Strings from the popup menu to show the subset.